The brig-rigged, sailing ship C.W. Lawrence was built in 1848 in Washington, D.C. When the United States gained control of California from Mexico in that same year, the C.W. Lawrence, captained by Alexander V. Fraser, was sent around the "horn" (Cape Horn at the southern tip of South America) to San Francisco to patrol the coast of California and enforce new revenue laws extended to the territory. Working under the auspices of The Revenue Cutter Service, the "Revenue Cutter" C.W. Lawrence remained in service until she ran aground and was abandoned in a storm at Point Lobos, south of San Francisco on November 25, 1851. 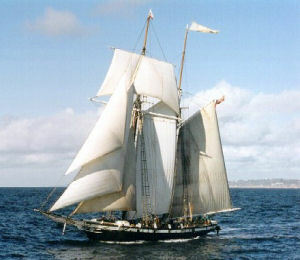 The Californian is a loose replica of the 1849 Revenue Cutter C.W. Lawrence that spent its years patrolling the California coast enforcing, or attempting to enforce, federal law. She is the only replica of this sort. The Californian was built in 1983/84, at Spanish Landing in San Diego Bay by the Nautical Heritage Society with permission from the Port of San Diego. Melbourne Smith designed and oversaw construction of the Californian. The United States Coast Guard provided C.W. Lawrence ships logs and actual plans for a sister ship to assist with the re-creation. For 18 years, the Californian plied the waters off the western coast of the United States, representing California in hundreds of special events, and visiting ports in New York, Boston, Maine, Hawaii, Canada, and Mexico. As tallship ambassador, the Californian represented the state during the 1984 Olympics in Los Angeles, at OP-Sail 86, celebrating the centennial of the Statute of Liberty in New York Harbor, during California's sesquicentennial, and in the Tall Ships Challenge California 2002. For 18 years, the Californian provided a valuable resource for all Californians inspiring an appreciation for the maritime heritage and coastal resources of the state in children and in adults. She provided educational trips for nearly 80,000 schoolchildren and journeyed 500,000 miles. The Californian found her way into Hollywood productions, taking roles in Steven Speilberg's "Amistad" and a number of documentaries. Hard times fell upon the Nautical Heritage Society however, when it failed to gain funding from a state energy conservation grant and was unable to finalize a contract with Operation Sail, Inc. in Washington, D.C. The Society placed the Californian on the market in 2002. In June, 2002, the Maritime Museum of San Diego received the largest gift in its history when the Sheila Potiker Family Foundation of San Diego contributed funds to purchase the Californian from the Nautical Heritage Society. When the Californian was transferred to the Maritime Museum of San Diego, a survey of the vessel made it clear that an overhaul of the electrical, plumbing, and mechanical systems would be needed in addition to cleaning, caulking, painting and a new set of sails (7,000 sq. feet). Restoration of the Californian was estimated at $400,000. Two things happened in February of 2003. The California Coastal Conservancy provided the Maritime Museum of San Diego with a $300,000 grant to complete restoration of the Californian and then California Assemblywoman Christine Kehoe introduced Assembly Bill No. 965 (AB 965) proposing to designate the Californian "the official state tall ship." The tall ship "Californian" was built at Spanish Landing in San Diego Bay and was launched in May 1984. In 1983 the Legislature adopted a resolution which designated the Californian as the official tall ship ambassador of California. It is a full-scale recreation of the 1848 vintage Revenue Cutter Lawrence, a government patrol ship that was the precursor to today's Coast Guard cutters. 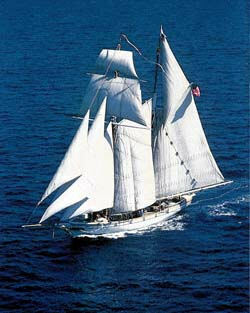 The "Californian" has nine sails, carries 7,000 square feet of canvas, measures 145 feet in length and weighs 130 tons. She casts a distinctive and instantly recognizable silhouette and has become one of the country's most well known tall ships. The "Californian" has served as a valuable resource for all Californians. Its voyages have enabled students and adults to develop an appreciation for the maritime heritage and coastal resources of the state. Fully certified by the United States Coast Guard, the "Californian" carries licensed professional crew and maintains safety equipment and procedures meeting Coast Guard standards. The State Coastal Conservancy has awarded a $300,000 grant to the Maritime Museum of San Diego to finish overhauling the ship. With this grant, the ship will return as a floating classroom for students. By the end of April, 2003, AB 965 had been unanimously approved in the Assembly and forwarded to the Senate. ...also maintains and operates the iron sailing ship Star of India, the oldest active ship of any kind in existence and maintains the historic steam ferry Berkeley as well as other precious and historic maritime assets. The Star of India and the Berkeley are each designated national and state historic landmarks. The Senate approved the amended version of AB 965 on July 7 and returned the bill to the Assembly for approval. In mid-August, 2003, the refurbished Californian embarked on a goodwill tour that included stops in Santa Barbara and San Francisco, before it arrived in Sacramento on September 3. On September 8, 2003, the Californian set sail for the trip home to San Diego. Paying passengers joined the crew on the homebound voyage that included a tour of the Channel Islands and a stop at Catalina Island before making port in San Diego on September 20. 423.5. "The Californian" is the official state tall ship. Source: California State Legislature, California Law, February 19, 2008. Source: California Assembly Chief Clerk, Legislative Document Archives, February 22, 2008. Source: The Nautical Heritage Society [No longer maintained], February 22, 2008. Source: Maritime Museum of San Diego, February 22, 2008. Source: California Coastal Conservancy, February 22, 2008. Nautical Heritage Society: The Nautical Heritage Society is no longer in business. The information contained on these pages is for reference only. What's left of the Nautical Heritage Society's website, maintained by Captain Eric Christman. This is still a great resource with lots of information about the C.W. Lawrence and the nuts and bolts of building the Californian, including pictures. Maritime Museum of San Diego: The Maritime Museum of San Diego enjoys a worldwide reputation for excellence in restoring, maintaining and operating historic vessels. The museum has one of the world's finest collections of historic ships, including the world's oldest active ship Star of India. Current owners of the Californian. Operation Sail, Inc.: Operation Sail, Inc. will promote the use of tall ships as centers of learning to ports around America. Operation Sail, Inc. will promote cultural exchange and good will through the medium of sail training and through its international tall ship programs. This learning shall encompass everything from sail training to America's maritime history..